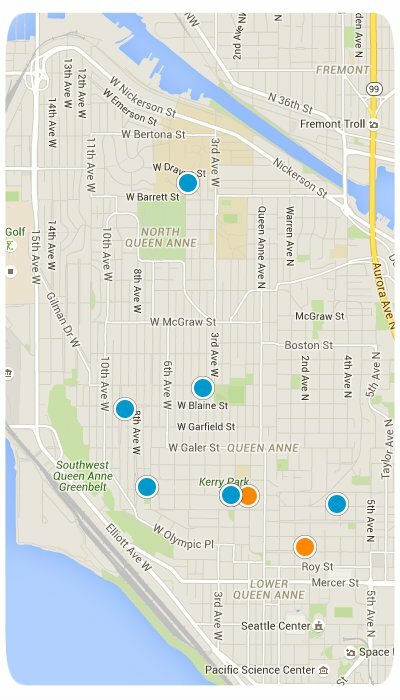 SearchHomesNW | Seattle-Queen Ann Real Estate-Easily Search all Queen Anne homes and condos for sale. Seattle’s Queen Anne Hill is both a neighborhood and a geographic landmark, sitting to the northwest of Downtown and bordering both Lake Union and the Lake Washington Ship Canal. Known as one of the most beautiful areas of Seattle, Queen Anne Hill offers beautiful properties and the picture-perfect Queen Anne’s Kerry park with panoramic views of Seattle’s most recognizable sites like the Space Needle, the Downtown skyline, and Mount Rainier. The homes for sale in Queen Ann are in high demand with local selling points including the popular nearby entertainment and upscale restaurant options. Homes for sale in Queen Anne vary: there are Condos For Sale In Queen Anne, Town-Homes For Sale In Queen Anne, and Single-Family Homes For Sale In Queen Anne. There are also many New Homes For Sale In Queen Anne and many under construction. Thank you for using SearchHomesNW.com to find 30% more listings than Zillow, Trulia, and Realtor. 6 /COVE ADD S 40 FT Bldg. Queen Anne 2nd ADD Bldg.